LGBTQ literature saves lives! The 13th Annual NJ GSA Forum needs fiction, nonfiction, graphic novels, memoirs and poetry. New or used, paperbacks, hardcovers and ARCs—if it’s a positive representation of the LGBTQ experience, we want it! The NJ GSA Forum is an annual conference sponsored by GLSEN Central Jersey and HiTOPS health education center. 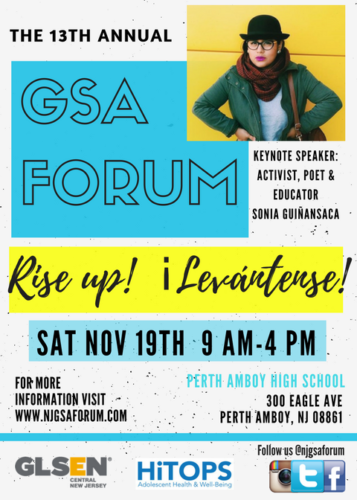 This year’s event will be held at Perth Amboy High School on November 19th and is expected to draw hundreds of LGBTQ youth, educators and allies from all over the state. I’ve volunteered at the forum for several years now and I’m so proud to play even just a small role in putting together such an empowering day. Young readers love discovering characters and stories that reflect their own experiences. We want every teen to go home with a book. Can you help us achieve our goal? We’re expecting a high number of bilingual attendees, so books in Spanish are especially in need. Thanks to all authors, publishers, agents, librarians and booksellers for your support! Megan McCafferty is one of the sharpest, funniest, most refreshingly candid writers working in the coming-of-age genre.